A Vietnam Veteran, Dave Cook learned to play guitar/bass at age 36 and has now been with Dwayne Elix and The Engineers for nearly 10 years. 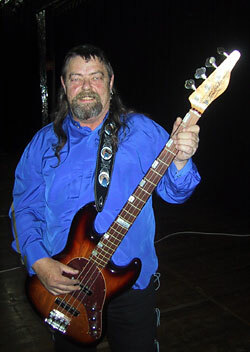 One of his dreams was to own and play a Tomkins Bass and that dream was realised a couple of years ago when he finally bought his from Allan at Tamworth. In his own words, "This is the best guitar I have ever played".